We sold our flat, closed our bank accounts, and left Hong Kong permanently. 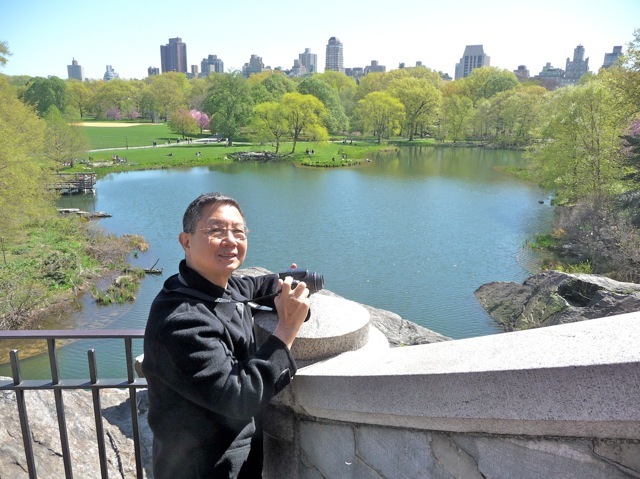 We returned to New York area where we had lived for 35 years during our youth, and resettled temporarily in Manhattan. The last month has been spent to re-acquaint ourselves to this fascinating city and its myriad offerings. The concrete canyons of NYC is still impressive. 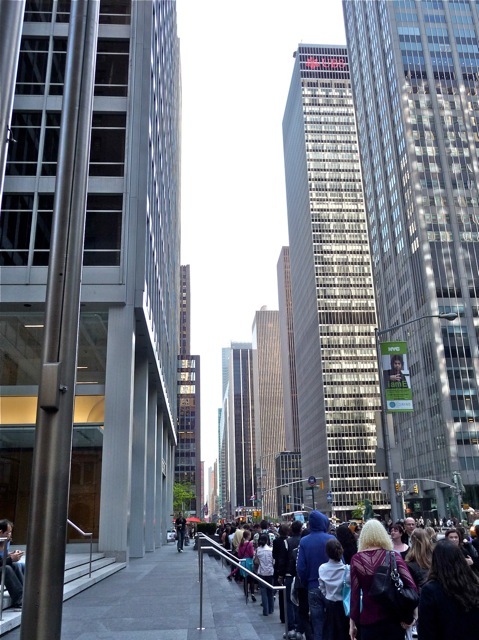 With new buildings sheathed in steel and glass, maybe it should be changed to glass canyon. Imaginative architecture abound. 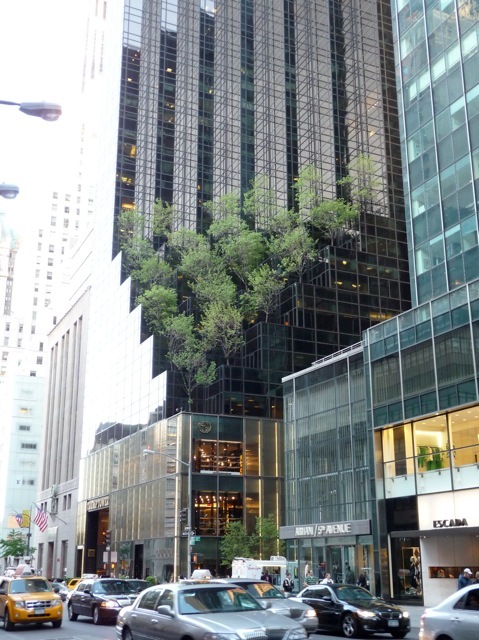 Cascading terraces planted with trees is the modern Hanging Garden of New York, not Babylon. 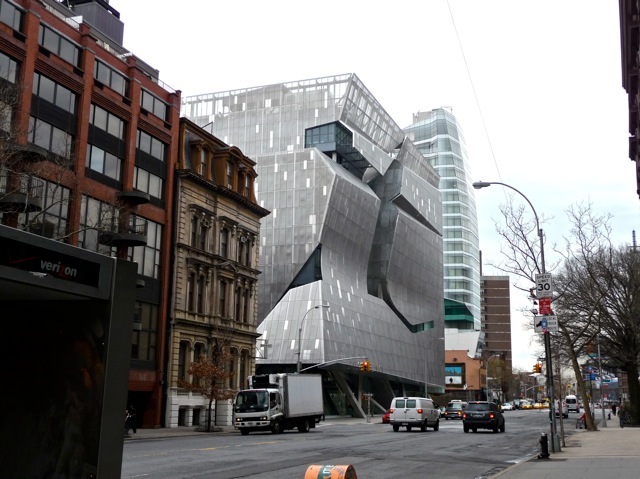 A curvaceous and avant-garde building is still the exception rather than the rule in New York. This one is located in East Village. Besides sky scrapers and tenement buildings, there are many elegant old town houses lined up in rows. 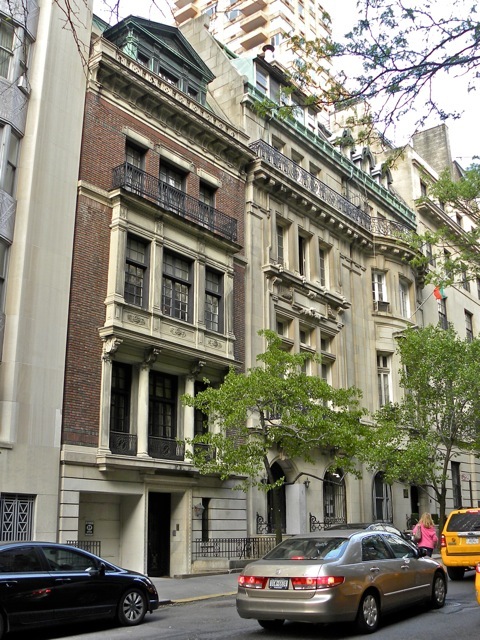 One of these town houses would cost tens of millions of dollars, and only the very rich can afford them. 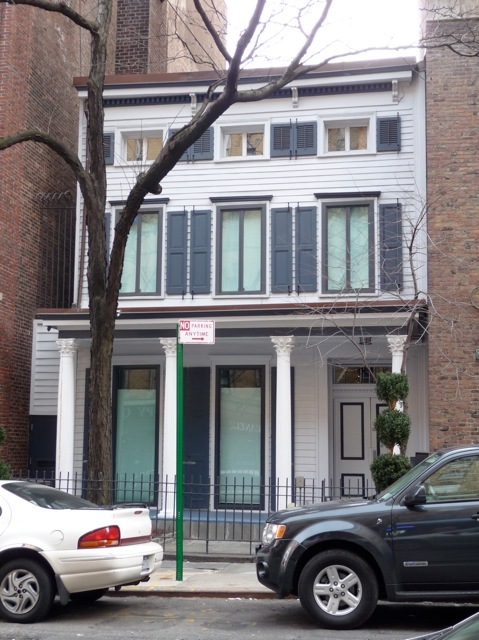 Sandwiched between tall buildings, an old row house survived for two hundred years in a residential area. 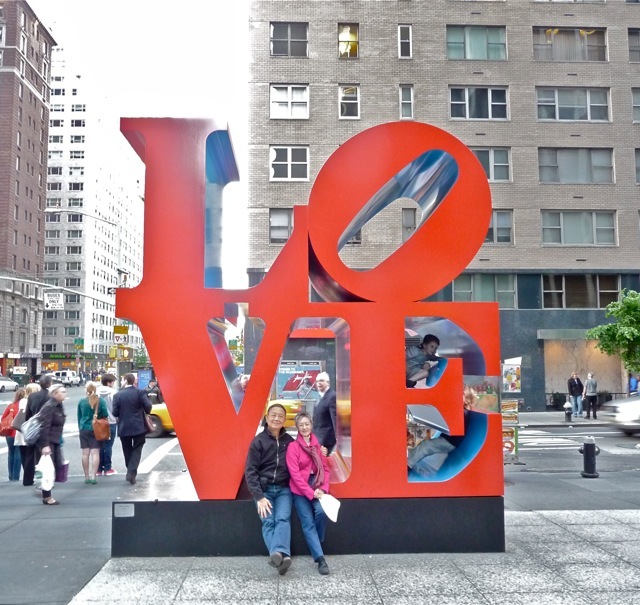 Sally and I sheltered by a big familiar LOVE sculpture. On Friday evenings, the Museum of Modern Arts has free admission. Hundreds of people snake around the block waiting to enter. Creations by famous artists like Picasso and Andy Warhol are on display. They are beautiful, if somewhat perplexing to us. 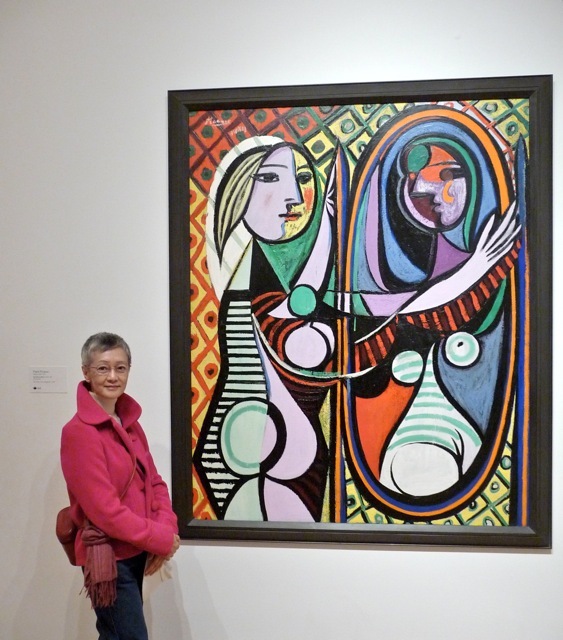 This Picasso painting Girl Before a Mirror seems to show the girl seeing herself as a man in the mirror. But then, maybe it has a deeper meaning that escapes me. 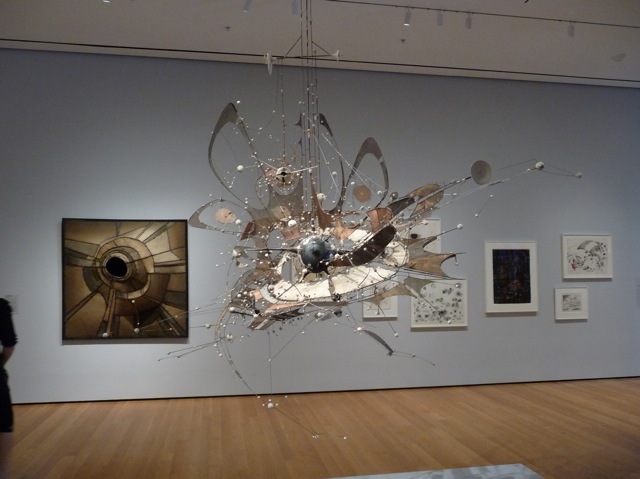 I enjoy this large hanging sculpture resembling a galaxy. It took the artist 13 years to finish this creation. 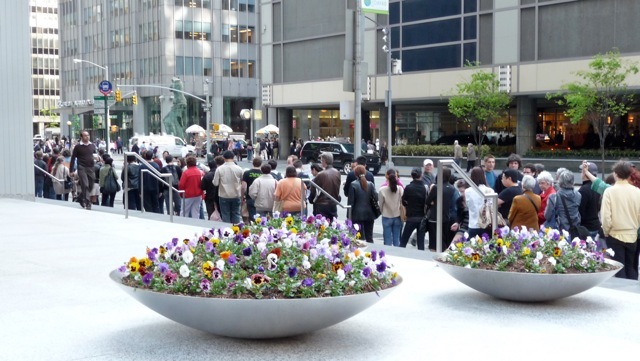 Contrary to the common image, New Yorkers can be friendly and warm. 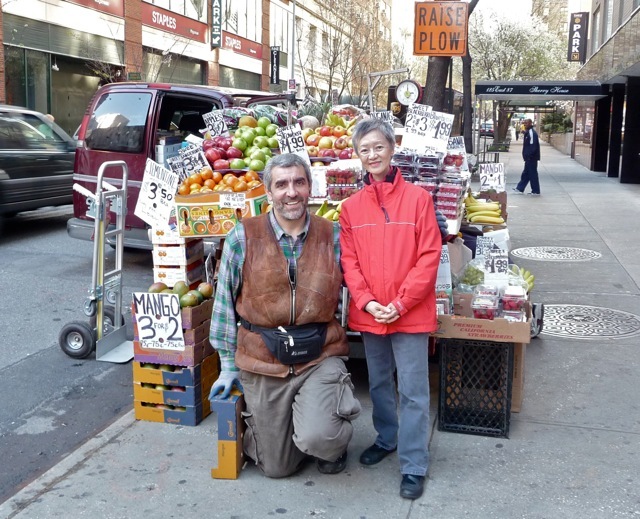 A fruit vendor offered to take this picture with Sally. We buy fruits and vegetables at these sidewalk vendors for they are fresh and cheaper than supermarkets. The name of this neighborhood can be frightening. 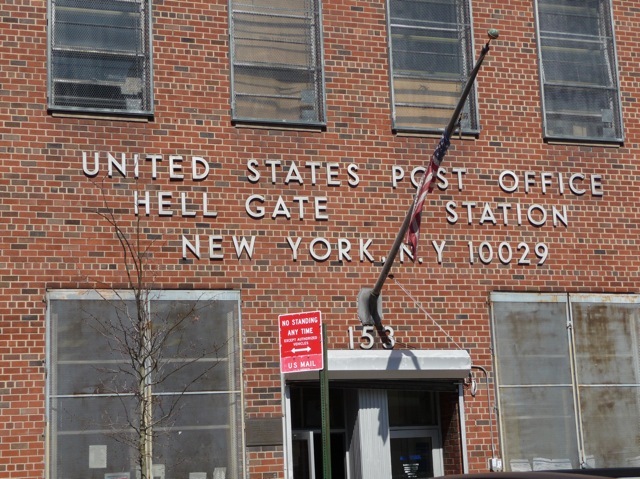 Another neighborhood in NYC is Hell’s Kitchen, equally scary. Hong Kong used to have similarly morbid place names such as the Hanging Ridge (吊頸嶺, modified to 調景嶺). 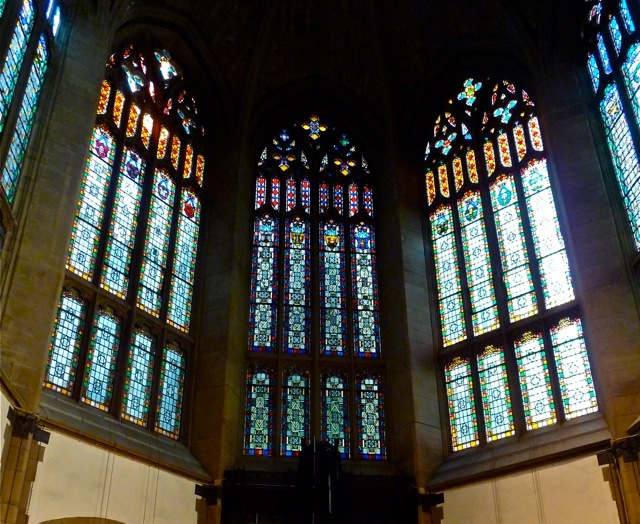 We enjoyed a wonderful piano recital in an old Park Avenue church decorated by stained glass windows made by the famous Tiffany Studio. We have been enjoying concerts and plays that we did not have the time or inclination to when we were young. 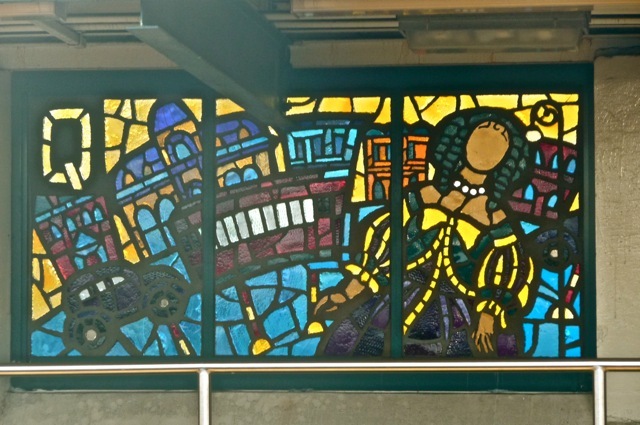 A more recent stained glass mural graces a subway station. They add a dash of color to the otherwise drab, 100 year old subway train system of NYC. 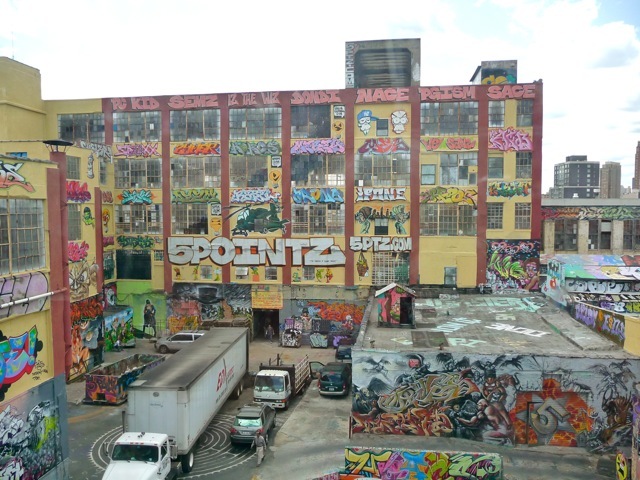 New York used to be saturated with graffiti on buildings and subway trains. 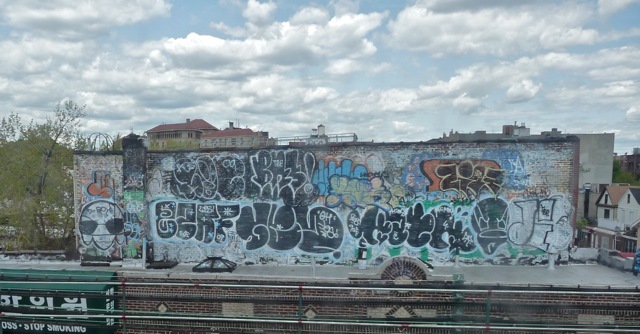 It took almost 20 years of herculean effort to clean up the graffiti from subway trains, and they are now pleasant to look at. However, graffiti are still found in less prosperous neighborhoods. One industrial building apparently invited many graffiti “artists” to “decorate” its outside walls. To me, the absence of graffiti makes Hong Kong a pleasant place to live in, and they make New York somewhat disturbing to live in. Americans still dabble in gaudy excesses. 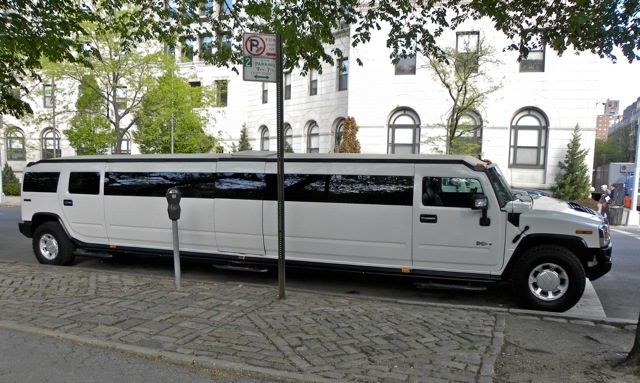 This bus-long stretch Hummer with blackened windows must be uncomfortable to ride in. Perhaps it gives a foretaste of a hearse ride. 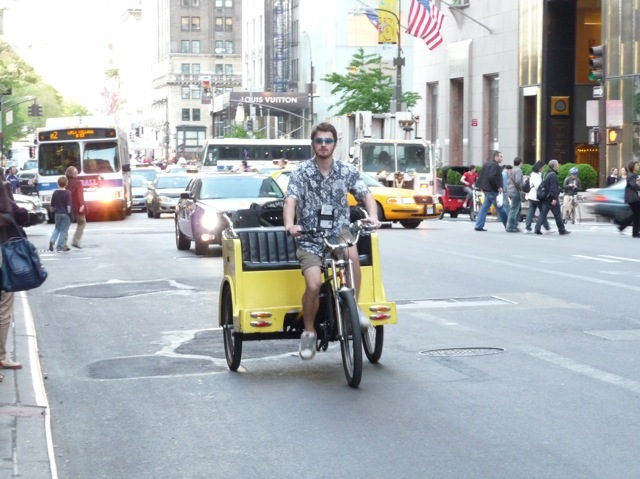 Man-powered trike taxi cruise New York streets, mainly for tourists. Apparently New York is trying to emulate Beijing in modes of public transportation. 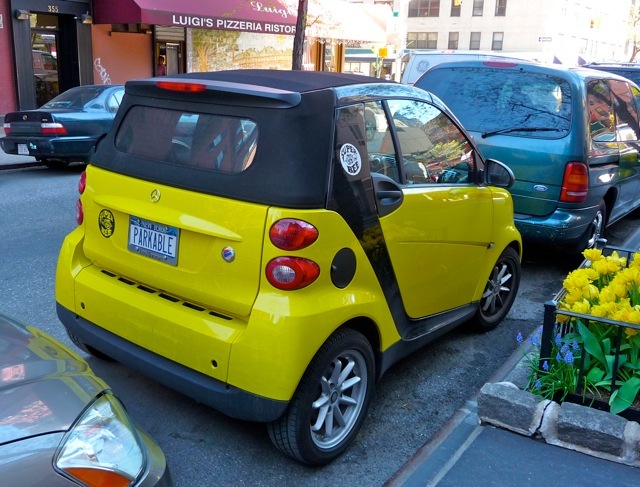 The license plate “Parkable” of this Smart Car explains its owner’s reason to buy it. Chinese superstition is well and alive even in America. 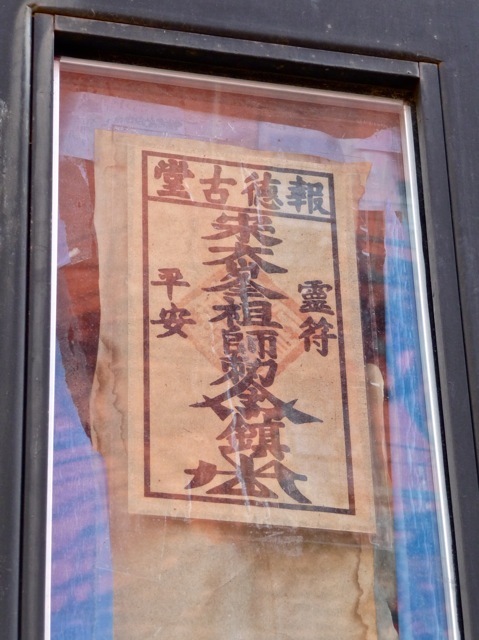 A Chinese restaurant involved in a multi-year lawsuit that closed its doors pastes a spell (符咒) on its boarded-up window. It wishes for peace and safety. 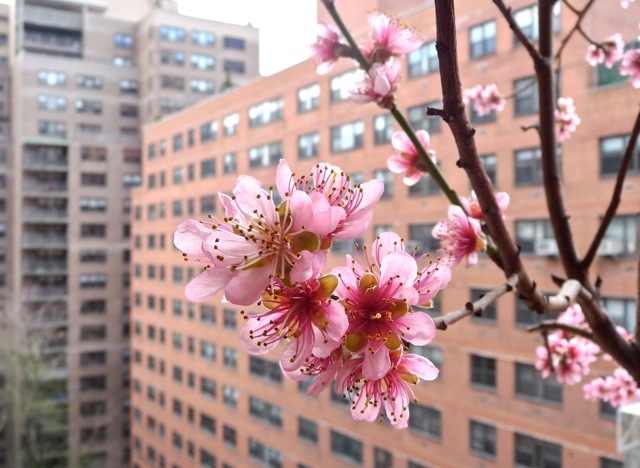 The peach tree (桃花) on my sister’s balcony sports beautiful flowers. April is the month when many flowers bloom. 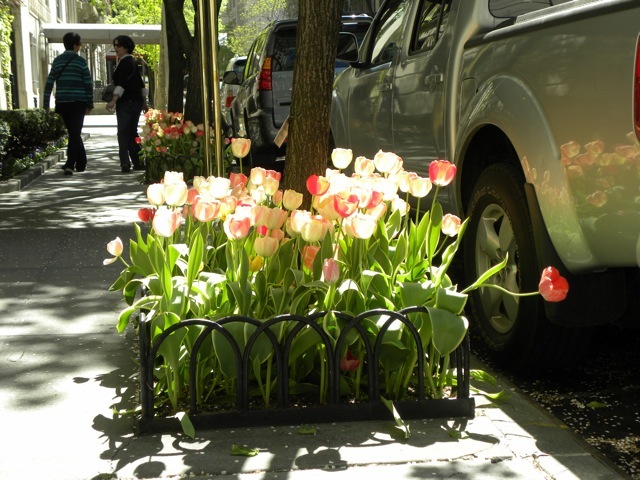 Sidewalks are graced by tulips planted in tree patches. 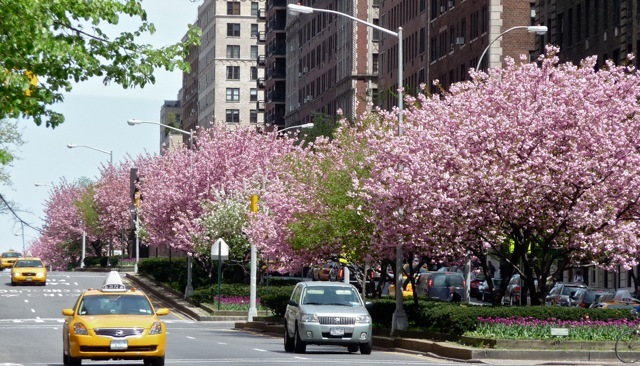 Park Avenue is decorated by rows of lush pink cherry blossoms. 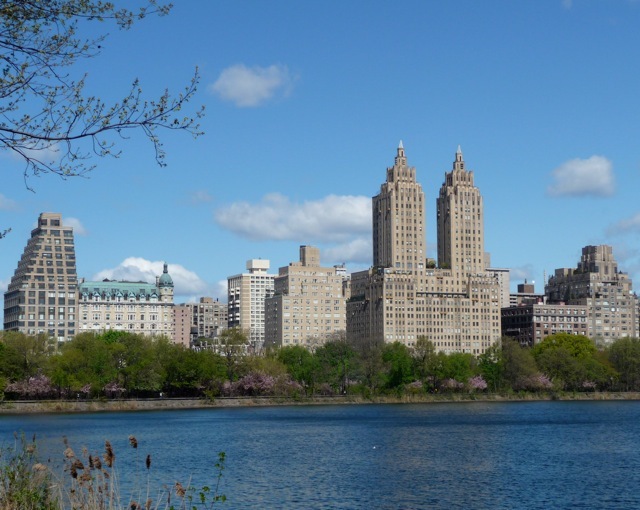 As we are living near Central Park, we visit the “lungs of NYC” frequently. This big piece of green land in the middle of Manhattan was occupied by squatters who were evicted when expensive mansions sprouted up around the park about 100 years ago. 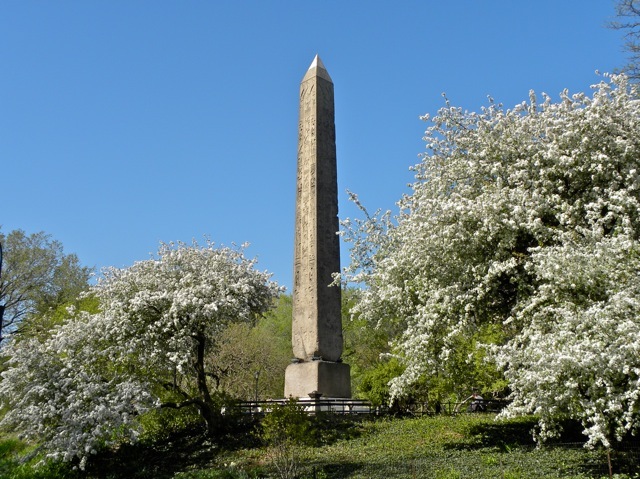 An Egyptian obelisk, commonly called “Cleopatra’s Needle”, stands in Central Park. It is an ancient monument of some 3,000 years old, and has nothing to do with Cleopatra. It is a gift from the Egyptian government to USA when ancient relics were not treasured as they are today. 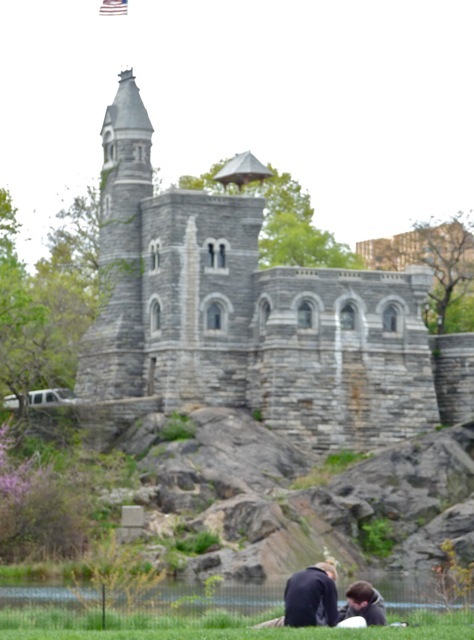 A little whimsical fortress sits by a pond in the park. New Yorkers enjoy lounging on the grass lawn in warm days. From the fortress, the pond and the lawn are peaceful and inviting. We visit Central Park in the day time, and never at night. One exception is to attend the summer evening concerts in the park along with thousands of otherNew Yorkers. 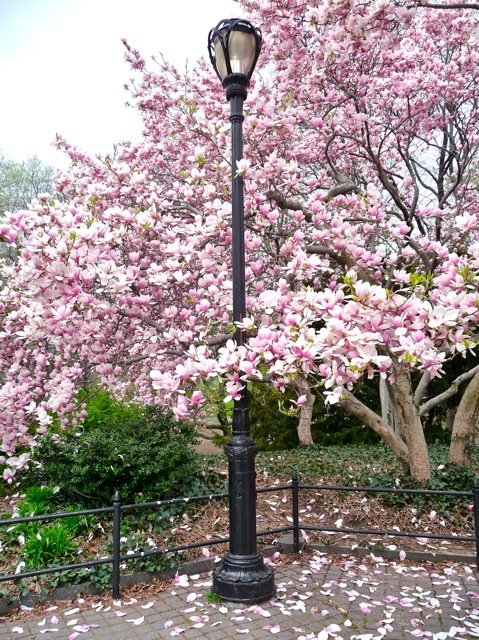 Magnolia trees (白玉蘭) in full bloom is a sight for sore eyes. 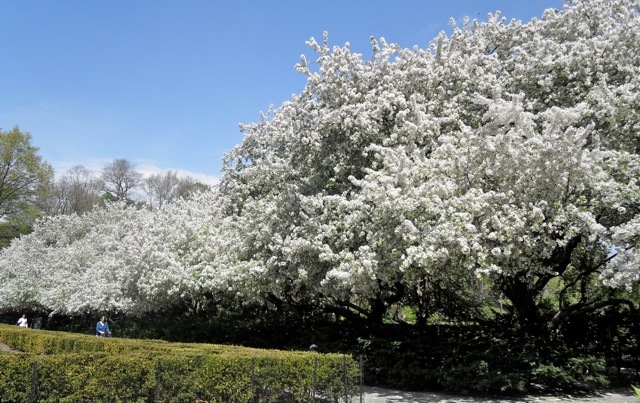 New York City streets are full of white pear (梨花) flowering trees in April. Like cherry blossoms, these pear trees do not bear fruits. 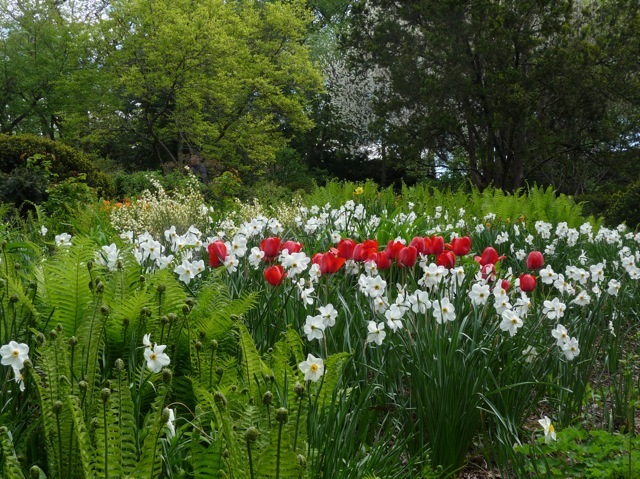 White daffodils (水仙花) and red tulips (鬱金香) cheer up a corner of the park. Beautiful flowers of unknown names appear everywhere. They are just so beautiful for pictures, whatever their names are. 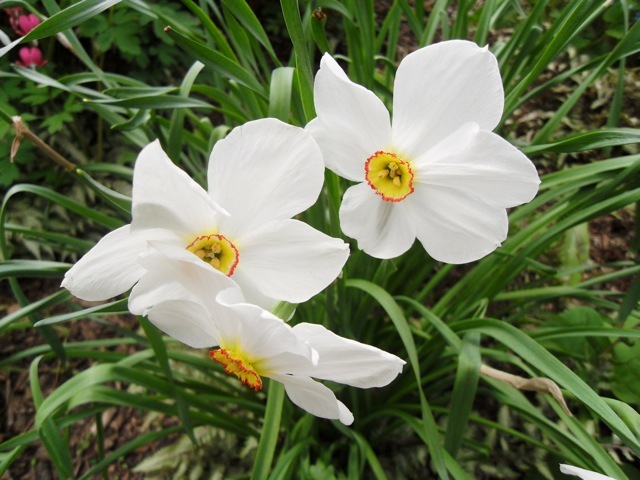 These daffodils have brightly colored center petals that contrast brilliantly against the pure white petals. One daffodil is beautiful. 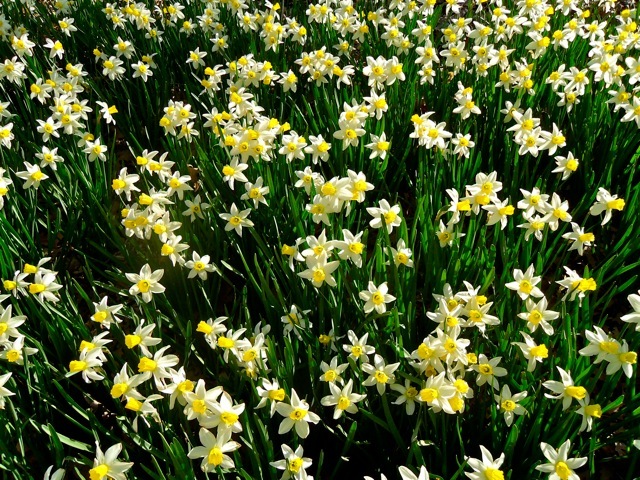 A field full of daffodils is delightful. 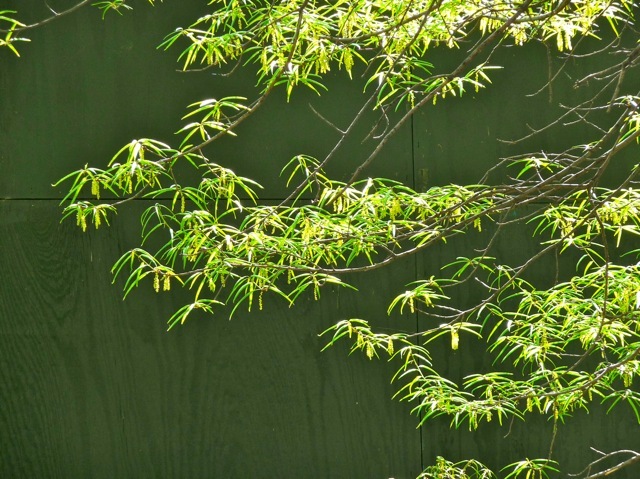 Against a construction enclosure, newly sprouted leaves give a Japanese feel to NYC. 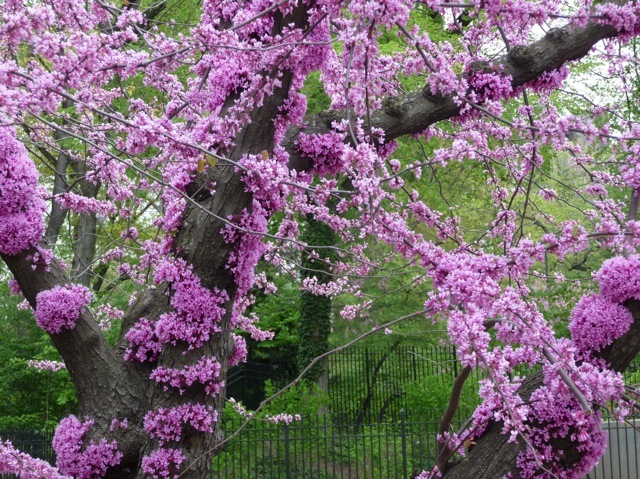 I love these magenta-red colored flowers of the redbud tree. Its color is close to that of the Hong Kong orchid, or the bauhinia (洋紫荊). It is native to North America and has no Chinese name. The clusters of tiny flowers glow close to the branches and the trunk, giving the impression of a tree with colored branches. 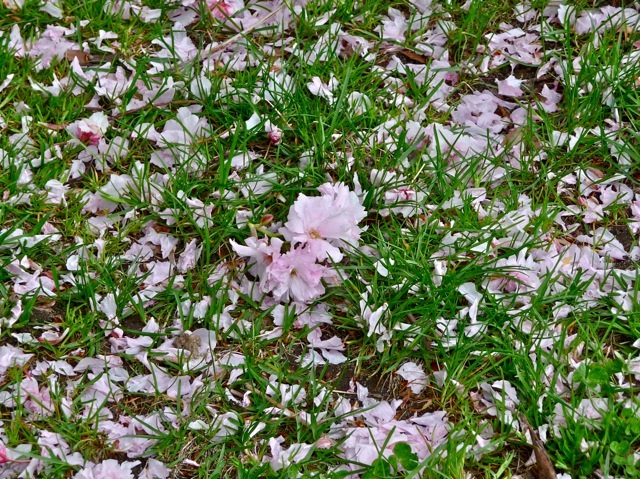 The cherry blossoms are uniquely flamboyant. 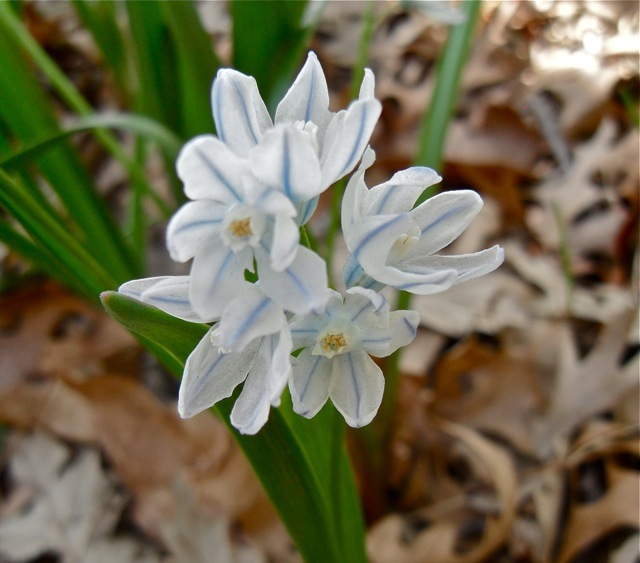 The flowers are multi-petaled and they cluster into crowded bunches. 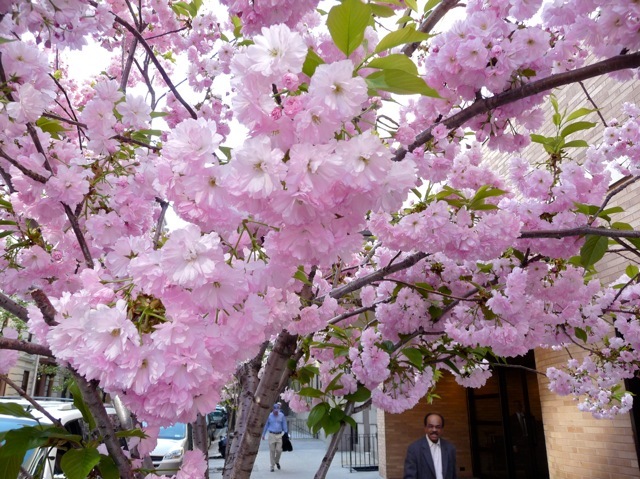 It is difficult not to be overwhelmed when several cherry trees blossom and cover a large area with pink beauty. Unfortunately, cherry blossoms last only a week or two before they drop like rain. This process of fleeting, brilliant beauty followed by rapid demise invoke strong sentiments in the Japanese people. THey like to gather under the cherry blossoms to party and drink, then lament the short duration of its beauty. 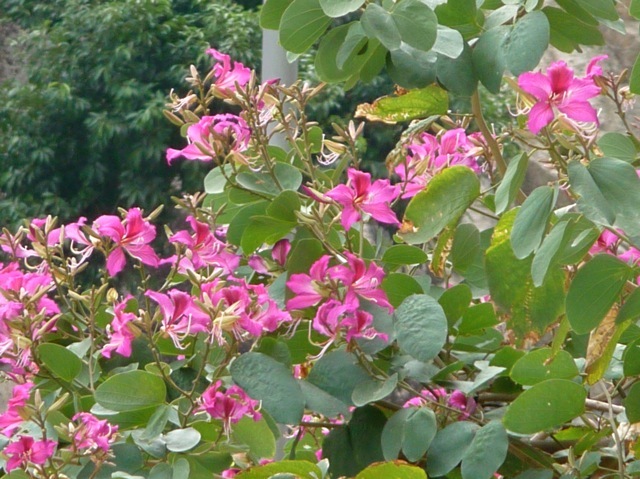 For me, I prefer the beauty of Hong Kong’s bauhinia (洋紫荊). Each flower is distinct and beautiful, the magenta color attractive, and they bloom a few time a year. The bauhinia tree next to our living room window in Hong Kong bloomed so often we were treated to almost constant views of beauty. We felt like we were on vacation in a southern island. THis picture is making me nostalgic about our living in Hong Kong. Posted by admin on Tuesday, April 27, 2010, at 11:42 pm. Filed under Uncategorized. Follow any responses to this post with its comments RSS feed. You can post a comment or trackback from your blog.